In every log cabin, wood suites or guest units of ours you'll find a kitchenette well-supplied with appliances, enabling independent cooking and home food-preparation. There is a minimarket in the village, with a wide variety of products (but no meat, fish, fowl or...cigarettes), which is open every day except Saturdays and holidays; an aromatic bakery based on whole wheat flour is at your service on weekends, holidays and during the summer. You'll also find there home preserves, jams, organic humus, olives and more. In Amirim one can obtain organic products and vegetables. In Amirim, there's a pizza delivery service to the guest units. 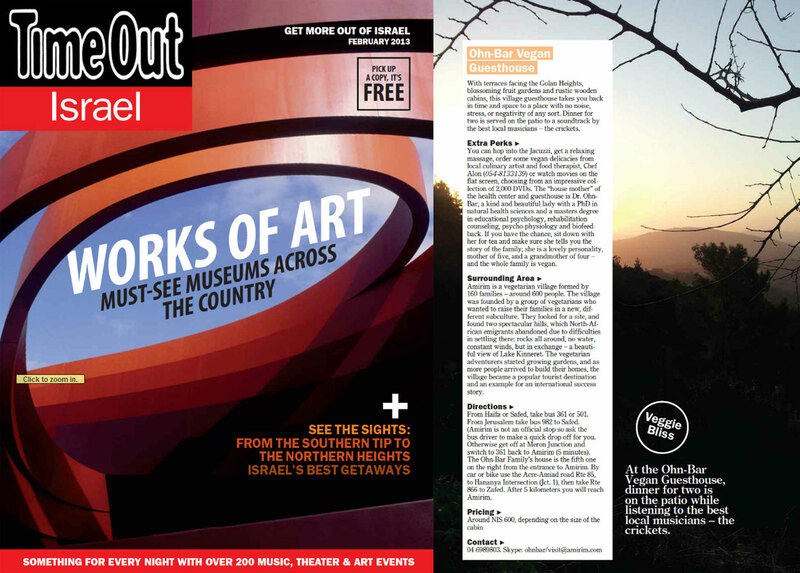 At Eyn Kamunim a drive of a few minutes, you'll find a choice of local cheeses, baked goods and home-prepared olives. In the village of Rama, 7 minutes from Amirim, you'll find supermarkets, produce shops, olives, thin Druze pittas, labaneh and fresh humus. "In the shade of the fig tree: - unique vegan food - about 20 minutes away. In the Dalton winery and Amiad winery, about 20 minutes away, you can taste and purchase quality bottled wine. In Moshav Safsufa, Gish & Rama - adjacent to Amirim, there's a pizza delivery service. 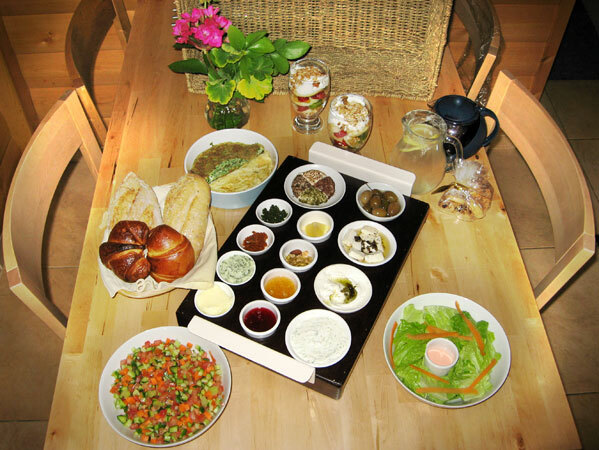 All this Galilean bounty you may combine into a private romantic meal within our guest units. Families or groups of friends who are our guests, may dine together, using the suitable garden furniture which is in the spacious patios that face the Kinneret. Rich meals, Delivered 5 days a week Sunday-Thursday 8:00-22:00 - order in advance until 14:30 - directly to your guest cabin. Telephone: 050-7523030. Bakery and home conditory – products from whole wheat flour: special rolls, regular and herbal pittas, challas for Shabbat, a choice of cakes, cookies and jams. Cakes for special occasion – with inscriptions by advance order. The cake can await you within the guest unit. On Thursdays, from 17:00 to 21:00 – home pittas baked in a tabun. You're welcome to sit in the garden and enjoy your meal (no pitta-baking in rainy weather). The bakery is open from Thursday through Sunday, from 8:30 to 19:00. Peterson Family, Telephone 04-6980984. TEACHER: Now, Simon , tell me frankly, do you say prayers before eating? SIMON: No sir, I don't have to, my Mom is a good cook.